Before, the rather large pants. I ripped apart the inside leg seams and laid the pants out flat to see what I was working with. As it turned out, I fit in the pants… turned upside down! 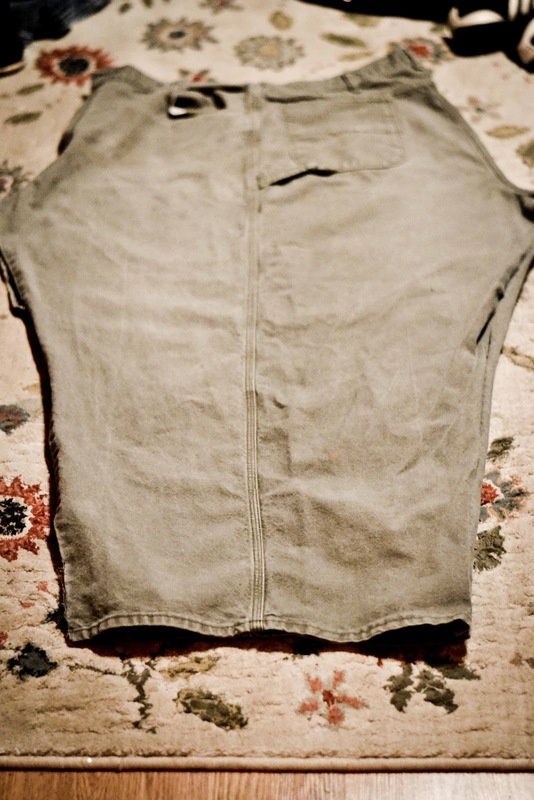 I sewed up the sides, changing to a basting stitch for the zipper about 6″ from the top of one side. Oh yeah! 😛 I was kind of stoked that it fit so well. It seriously could have been a floor-length A-line skirt, but I wanted a shorter one. Plus a 42″ hem on a floor-length skirt is kind of restricting, so I was sure I would trip all over the place. I chopped it off, added some darts on the back to make the waist fit, put in the recycled zipper from the pants’ fly, and serged the hem! I’ll admit that even though the pants-turned-upside-down did fit me just fine, it was a little form-fitting. 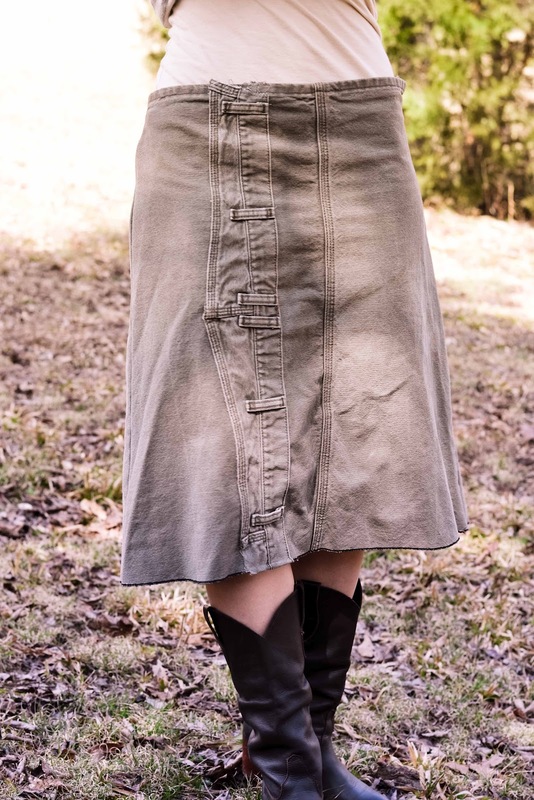 So to make the skirt more modest, I added a 1.5″ strip of fabric down the front to make it less tight. To cover up the weird added-fabric, I just sewed the back of the pants over it! I love the effect. 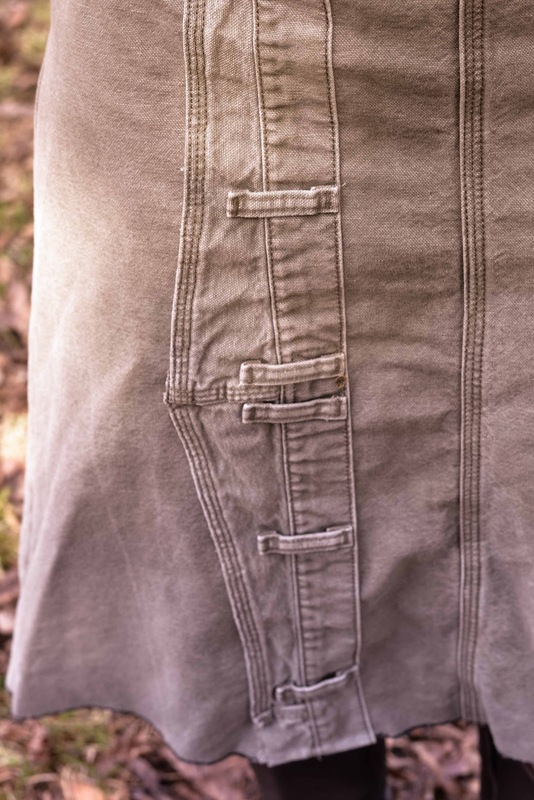 When I sewed the back of the pants onto the front (what is that called? A placket? waistband? yoke? ), I just folded the edge under the hem and stitched it there to finish the raw edges. 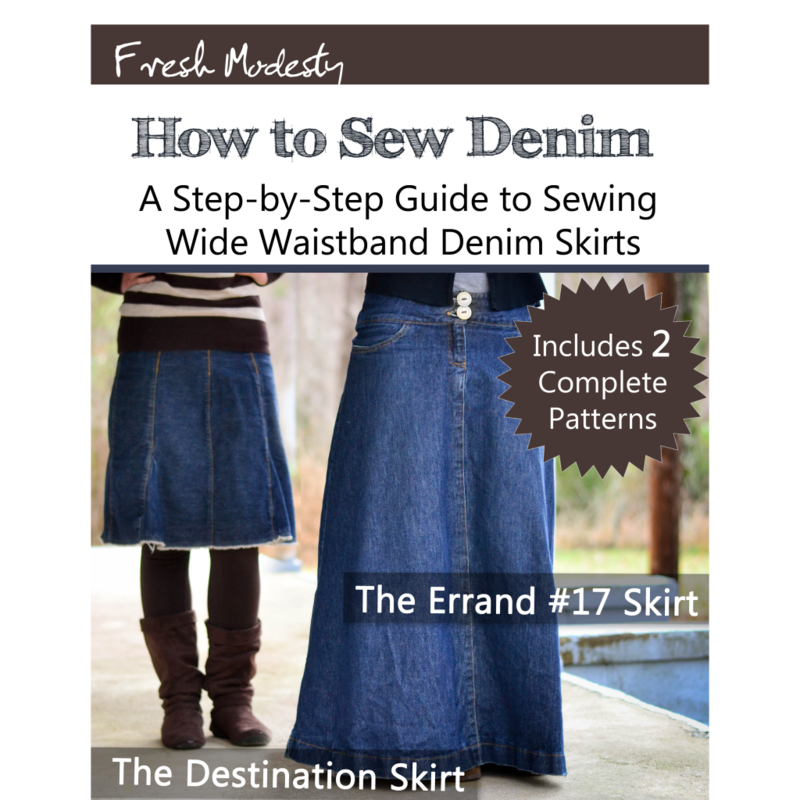 Would you rather cut up an old pair of jeans to make a skirt or buy new denim? Which do you do more often? Which do you think is more economical for your purposes? 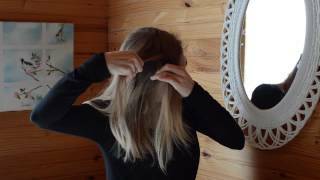 This is a really cool look! I love it! And I'm jealous of your thrift store, haha…all the ones near here are so overpriced! You are very creative and talented! Great thinking and use of materials! Our thrift stores are very overpriced too. Sigh. Awesome!!! I want to try this someday!!!! LOVE IT!! I LOVE thrift stores! I really like the skirt, and its turned out really well, Love the detailing on the front. I'd buy an old pair of trousers anyday and reuse then go out and buy denim – it is soooo expensive! I LOVE your skirt. Ingenious idea, and great use of old jeans! About darts, have you heard of pressing your darts to one side (the opposite side from the direction you want them to go), and then pressing them the opposite direction (the direction you really want them to go)? Also, another way to make sure your darts don't have a funny point at the end, is to not backstitch at the point of the dart, and to tie a double knot (or the most secure knot you know 🙂 ). Nice idea! It turned out really well. I like the front too! I've cut up a pair of jeans to make a few bags. One time I used one leg for the bag itself, and used the other leg to plait the handle. 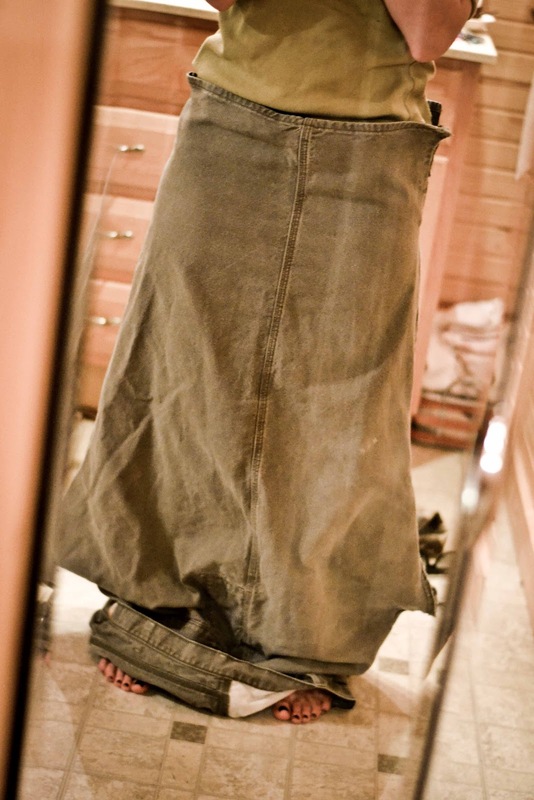 I think making myself a skirt out of an old pair of jeans would save a lot of steps, and look just as good if not better, so long as I can word around the thick parts without breaking lots of needles! I've done it once before but would like to try it again. 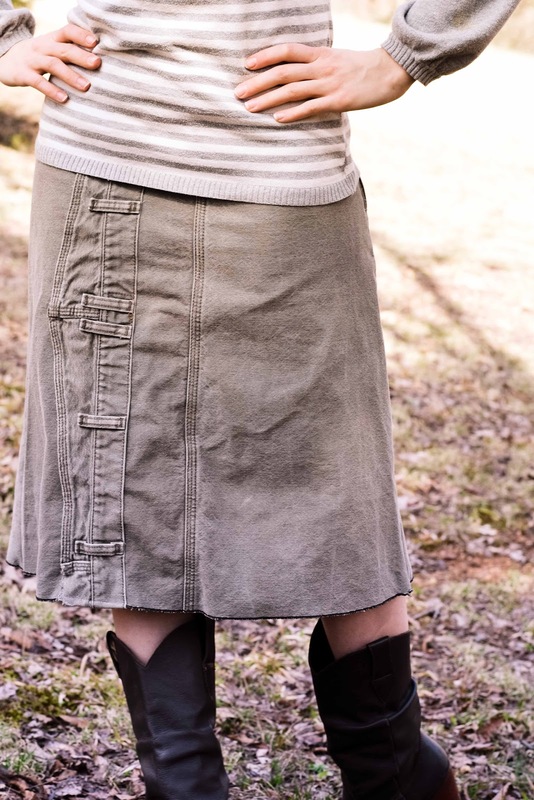 Hi, I enjoy seeing how you make your skirts – they are really neat! In regards to darts, my Mum always taught me to stitch 3 or so stitches right along the edge of the fabric fold at the point of the dart, and then to tie a double knot before cutting the threads off. Maybe this will help? Not sure with heavy fabric! Maybe you could top stitch them down on the right side really close to the seam line? 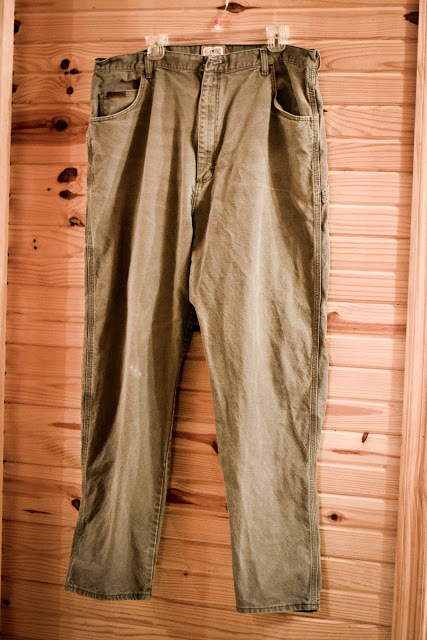 Love the way you have upcycled the old pants! Our local thrift store has lots of cheap stuff AND a free bin!! Always have to look there. RE: darts- A longer taper on the point might help (that mean you stitching line is somewhat curved rather than straight. Just found your blog – great work! For darts, I find that topstiching them down really makes a difference and they blend in more – I also agree with a previous poster that you should taper the point of the dart more. Thanks! I'm just starting out with sewing and wanted top but a seeing machine that will handle denim and heavier fabrics. Very cute! I agree with the knot at the tip of the dart and to make sure it is tapered appropriately. 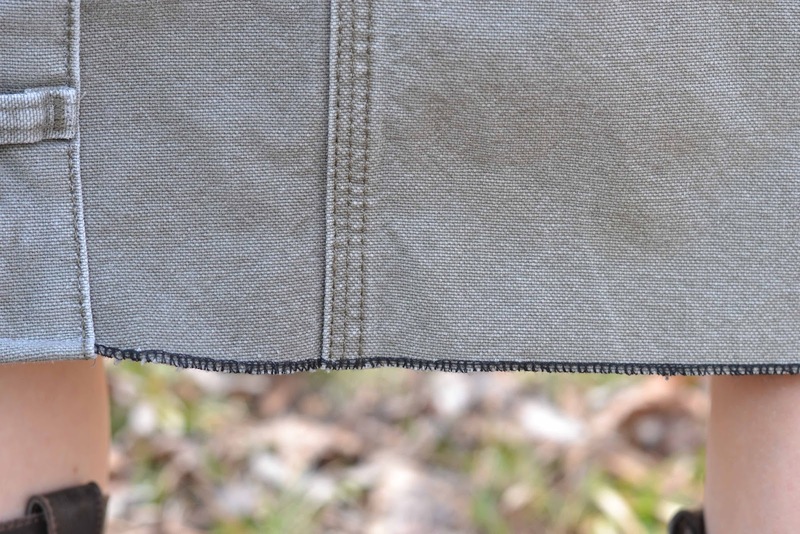 Also, you can pound the seam with a hammer on a firm surface with bulky fabrics to reduce their bulk a bit. Experiment with scraps to make sure it will work for you. It can make a bit of a shiny spot, so you may need to put another bit of fabric between the hammer or the surface depending on which side you pound. This is how you "press" seams for leather. If you use a curved surface to pound against, and just focus your attack at the seam from the back side, it works the best. We LOVE it! You are so clever! I am so looking forward to trying this. My favorite thrift store has a 25 cent rack and has always has tons of over sized men's pants. I can't wait to try this tutorial. 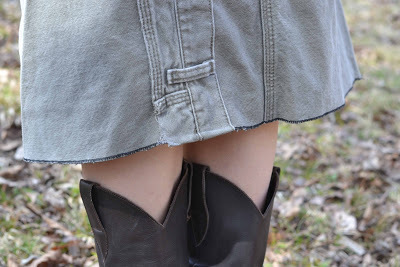 It's so much more simple then the traditional way of turning pants into skirts. 🙂 Thanks for sharing. this is really adorable and so creative. I am a novice sewer, but really want to learn how to sew clothes for myself and my little girls. Something i hope to pass onto them as well. Thank you for this site.